We know that you are busy, but if you are considering buying a new or used 2017 250cc four-stroke sometime in the future, it behooves you to take a few seconds and read these bite-size bike reviews. This 2017 MXA 250 Shootout has been distilled down to the basic facts. If you want more detailed information, there is a link at the bottom of each bike that will take you to a full-blown test of that machine. No other 2017 250cc four-stroke can say it has the best overall power, weighs the least, has a bulletproof hydraulic clutch, incredible brakes, electric starting, a 14,000-rpm rev limiter, intuitive handling, an ingenious air-filter system and the best air forks ever made. There are innovations on the 2017 KTM that the Japanese brands will not get around to for at least four years. KTM 250SXF MINUSES: Its high-rpm engine demands talent on the owner’s part. The 2017 Husqvarna FC250 is the user-friendly version of the class-winning KTM 250SXF. It makes mellower power, revs slower and is more Novice-oriented than the orange bike. But, don’t think that means it is slow. It makes almost 4 more horses than its red, yellow, green or blue competitors. It’s just more comfortable, absorbent and pleasant than the KTM 250SXF. HUSQVARNA FC250 MINUSES: The airbox chokes up the engine, and it weighs 2 pounds more than the KTM. The 2017 YZ250F is up in horsepower across the board—and is exceptionally good in the low-end and midrange. With the exception of the elite Kayaba SSS suspension, the bulk of the YZ250F is a working-class hero. It is not blessed with the best handling, strongest brakes, lightest weight or most power. It gets the job done without any fanfare. The overall package is greater than the sum of its parts. YAMAHA YZ250F MINUSES: It’s loud (from both the muffler and airbox). The 2017 Kawasaki KX250F has improved handling, better ergonomics, upgraded suspension and weighs less than the 2016 model. We applaud Kawasaki for paying so much attention to the chassis, weight and ergonomic details. The 2017 KX250F chassis is a breath of fresh air, but we wish Kawasaki had left the engine alone. 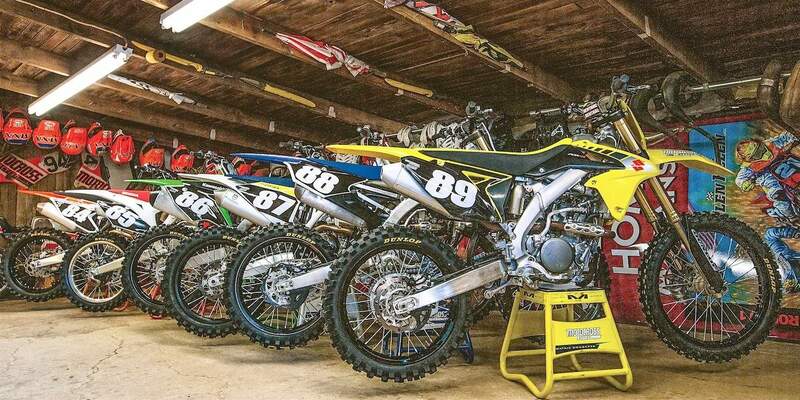 Every MXA test rider prefers last year’s full-blast engine over this year’s linear powerband. KAWASAKI KX250F MINUSES: We’d love the new powerband if it made 44 horses, but it only makes 40. The 2017 Honda CRF250 is at its best in the hands of Beginners and Novices. Obviously, faster riders will either abandon the CRF250 or break out the credit card to buy real power. We don’t recommend spending money on hopping-up a CRF250, because your bank account isn’t big enough to make it as fast as a stock KTM—or as light. The 2017 Honda CRF250 weighs 2 pounds more than a 2017 KTM 450SXF. HONDA CRF250 MINUSES: Horsepower is overrated, but a total lack of horsepower does not rate. You don’t buy an RM-Z250 for its power, brakes, clutch, accoutrements or modern looks. You buy it for its cornering ability. Sadly, most MXA test riders weren’t willing to give up the basic elements of a race bike for a tight-turning radius. The 2017 RM-Z250 only makes a 1/2 horsepower more than the 2011 RM-Z250. In the same time span, the KTM 250SXF gained 8 horsepower. SUZUKI RM-Z250 MINUSES: “Slow” is not good advertising copy. ASK THE MXPERTS: WHAT’S A KTM WITHOUT THE “K”?